A great part of taper is re-watching running movies from our collection. A must see for Chicago Marathon is “Spirit of the Marathon”. We got to meet the Director, Deena Kastor and part of the cast at the Chicago Marathon expo last year. Every moment I can all week-long is just in taking water and electrolyte drinks. Bottoms up! Subway, Subway, Subway….it all started with Mercedes Marathon. After my tummy trouble in Chicago Marathon last year we ended up doing a bland routine of Subway prior to Mercedes Marathon, and it worked! Why Subway? Well it’s easy to find everywhere when traveling and the food is so basic. 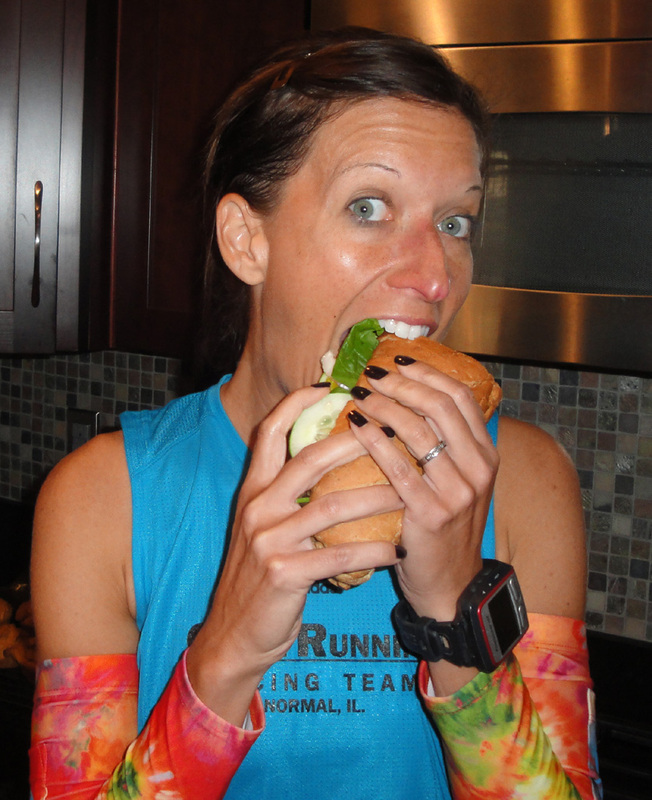 My taper choice: wheat foot long, no cheese, all veggies, no sauce…simple as it gets. Almost like a bland food diet if I were recovering from a stomach bug, nothing adventurous for the next four days. My other bland diet items? Whole Wheat mini bagels with natural peanut butter, apples and bananas. I can’t help but look at the weather forecast a 100 times a day, even when I know it’s really a range and rarely gospel. The good news is no stormy weather is in the mix. The next four days are the same forecast so looking at the hourly reports for Thursday and Friday it looks like race time will be from 52-maybe 60 at the end. Works for me! I don’t mind this temp at all. In fact I hate feeling too cold so I’m betting this will feel amazing! And if it doesn’t, then I will just slide my sleeves down, start to melt, then shirt off…no biggie. Getting cooler is easier than trying to get warm in a long race. My body takes to the less running quickly, anytime I lie down on the couch, I’m out. I’ve been getting tons of sleep, and I can’t seem to get enough. I do notice that I remember my dreams more on taper and it’s completely random stuff that makes no sense. Prevention in our house includes taking Tums for a good tummy, epsom salt soaks to keep muscles relaxed, foam rolling, Biofreeze, all the good stuff. Good stuff! I’m soooo sick of tapering…..ugh. Yeah it gets old quick! thats so weird you mentioned that about remembering dreams during taper! the exact same thing has been happening to me! i remember EVERY dream this week! SO crazy!!! taper is NUTS! Yeah I assume it’s less running means I’m not sleeping as deeply and I probably have more anxiety cause I’m not running it off. Too funny! I am a big fan of subway for fueling. I ate it before my Arizona Rock N Roll marathon and felt totally ready to go. GOOD LUCK this weekend! i just had subway yesterday. delish. good luck and have a fab race as you always do!